As the pattern over North America shifts, an extended period of potential severe thunderstorms targets the central U.S. Although this update covers May 6-10, thunderstorms are ongoing today (May 5th) and were prevalent in prior days as well. The difference here is that we are gradually starting to see more and more potentially potent setups on the horizon. Wednesday, May 6th: This day has been on the radar for a while and things are coming into somewhat better focus. As shortwave energy pivots from the High Plains to central/northern Plains on Wednesday, an area of surface low pressure will develop. With more forcing in place than prior days, that alone signals an enhanced severe weather threat. By Wednesday afternoon, a portion of the surface low should be crossing over from far eastern Colorado into western Kansas. The strongest forcing should reside from northwestern Oklahoma into central Kansas. However, the greatest instability will likely be displaced further south from central Oklahoma down into north Texas. Partial to considerable cloud-cover will tend to limit the amount of destabilization that takes place. That combined with modest flow at 500mb, progged to be on the order of about 35 to 45 knots, will tend to limit the extent of the severe weather potential. The surface low itself is also a bit elongated. If it were more concentrated and also deeper, that would signal a greater severe thunderstorm potential. Nonetheless, with a tongue of 1,000 to 2,000+ J/kg CAPE, favorable speed and directional shear, and some forcing aloft should favor at least scattered severe thunderstorms by mid to late afternoon. It comes down to northwestern Oklahoma into central Kansas for what should be the greatest severe threat. More isolated severe storms are still possible along a dryline down into western and central Texas. Large hail, perhaps very large in a couple of storms, appears to be the most significant risk. Damaging winds will be possible, especially into the overnight as storms may tend to merge into lines. There is a tornado threat, which should be maximized during the early evening hours, as the low level jet ramps up. As has been the case many times this year, while there is an evident tornado threat, the intensity and duration of any tornadic storms will be dampened somewhat by the limiting factors mentioned above. There is a fairly good likliehood that multiple tornadoes (but not a major outbreak) will be reported late Wednesday afternoon into Wednesday evening. Thursday into Friday, May 7th and 8th, also provide some severe weather threat, but in a more isolated and sporadic nature. Upper level heights should remain fairly neutral through the period with no significant forcing noted in the models. Each day is likely to feature moderate instability and at least marginally supportive wind shear for supercell thunderstorms. The corridor for this period should be narrowed in on the Texas panhandle, portions of interior Texas and into Oklahoma. While some severe threat may nudge into portions of Kansas, the greatest (still somewhat limited) threat should hang back further south. Each day, storms may produce large hail with some damaging winds and a few tornadoes. Each day, watch for a few things: First, where is the greatest instability? If cloud-cover and convective debris are limited during the morning, expect a somewhat enhanced severe weather threat during the afternoon. Also, look for any outflow or other mesoscale boundaries that can be the focal point(s) for storm development. Finally, notice any upper level perturbations, even if seemingly minor, as they could provide just enough forcing to locally increase the severe threat. Saturday, May 9th has the potential, but the keyword is potential, to be a significant severe weather outbreak with numerous tornadoes. The overall pattern is favorable, as a trough swinging from the Four Corners region to eastern Colorado/New Mexico by late-day will provide ample forcing from the High Plains into portions of the central to southern Plains. Caution must be applied when looking at the analogs, but there is a fairly strong signal from the analogs that favors widespread severe thunderstorms and at least isolated significant severe events, including strong and/or long-track tornadoes. Now, even though some major events show up in the analogs, there are a few limiting factors that will not favor a high-end outbreak. While the flow and forcing increase aloft, 70-80 knots at 300mb and 50-60 knots at 500mb will fall well short of an event such as 4/14/12, which showed up as a GFS-based analog. As far as instability, even though moderate CAPE values are predicted, we’re not looking at strong to extreme instability. There seems to be a common theme, with this week especially, that the atmosphere is not quite taking full advantage, resulting in a less extreme “than possible” setup. With all of this said, even if the timing is not exactly right, and the timing looks pretty favorable right now, severe thunderstorms are strongly favored on Saturday. What will be the difference between a low-end event and a more significant outbreak will come down to mesoscale details. What also favors severe weather on Saturday is how the models, overall, have been in very good agreement with the general setup on Saturday for quite some time. The focus on Saturday ranges from north Texas through much of Oklahoma and Kansas, to perhaps as far north as portions of Nebraska. All severe weather modes are anticipated, with an enhanced risk of tornadoes. Sunday, May 10th is a bit further out there, but yet another severe day is quite possible. Details are a bit more muddled, as the evolution of Saturday will have a sizeable impact on what transpires on Sunday. The threat zone inches somewhat east, ranging from portions of Texas up through central and eastern Oklahoma, eastern Kansas and perhaps into portions of Missouri and Arkansas. 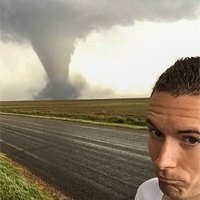 In summary, expect severe weather threats for the rest of this week and likely through most of this weekend across the central U.S. At least a few severe thunderstorms are expected each day, with scattered severe storms on Wednesday and perhaps a mode widespread and significant event on Saturday. Tornadoes are possible each day, but the day with the likelihood for the most tornadoes is also Saturday. In terms of storm chasing, there should be many quality opportunities to get out in prime real estate, from the High Plains into the Plains west of I-35. With the threats covering a long period over some similar areas, it may be worth while to hunker down and start thinking of possible targets or even just places to stay (if you’re planning a multi-day trip). Without giving too much away, and since details may change, I tend to favor a corridor from the Texas panhandle into southwest and central Kansas. Climatology also favors this zone for the greatest severe weather threat and trends this year have kept the dryline a bit further west, mainly across these areas, during most events.